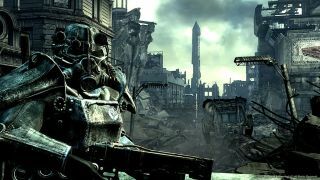 At the beginning of Fallout 3 you're a baby. Later, you become a beefed up good samaritan capable of knocking off ghouls and deathclaws with aplomb. That's what is meant to happen, anyway. Some people never grow up. That's the case for YouTuber Bryan Pierre who, implementing a glitch which allows the player to exit the opening vault prematurely, has managed to complete the whole game as a baby. This has crazy lore implications, of course. Could the post-apocalypse really be that bad, if a boy or girl barely three feet high can save humanity? Maybe irradiated Washington isn't so bad afterall? The video above is the first instalment of several. Make a cup of tea, kick back, and watch one of the oddest gaming achievements in recent memory. You might as well, since Fallout 4 is still months away.